From the bachelorette party to the bridal shower, there are so many wedding events to celebrate leading up to the big day! There are great venues in and around the Atlanta area to help you host the best pre-wedding event (a lot of these would also be fantastic for baby showers too!). I have done the research for you and found a few of the best ones for your wedding related events leading up to your most special day. So ladies, think all things wedding related around Atlanta. Urban Tree Cidery is West Midtown’s newest event venue. They are a full-service cider manufacturing facility that offers tastings, tours, and hosts special events. They love to host anything from wedding rehearsals to bridal showers. They even have a list of preferred vendors that can handle the food and desserts for your celebration. 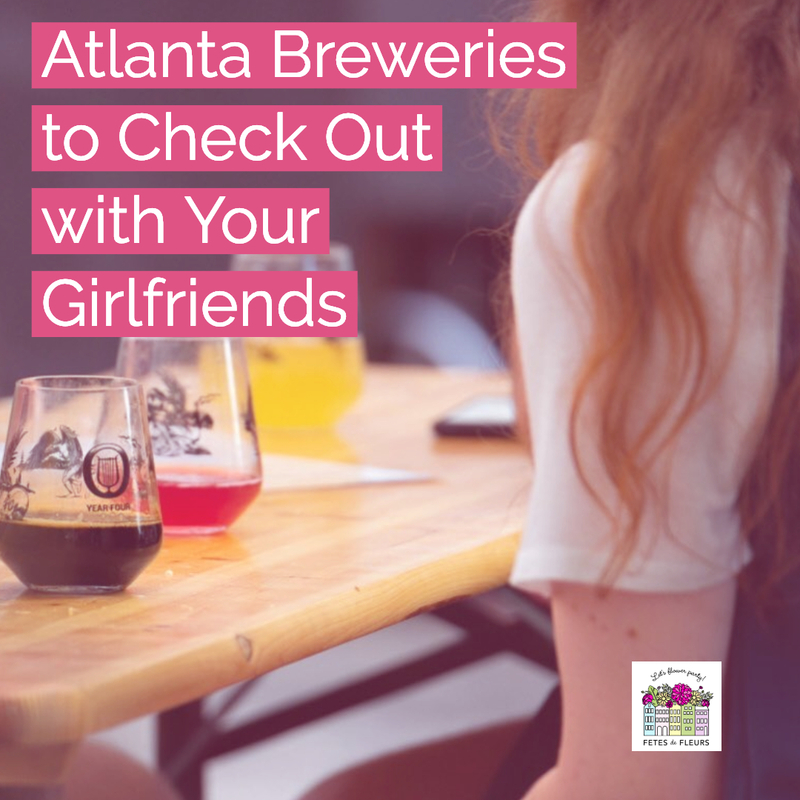 You can also check out this post with the best breweries around Atlanta for more options if you want to host a bridal shower or wedding related celebration over some fantastic beers and brews! We think having a flower crown bar or station at your bridal shower or wedding related event would be a fantastic option. Your guests could be drinking beers while making flower crowns. What is cuter than that? You can request information about booking a private celebration on their site here. You can check out their INSTA here for inspiration for your function. Just Add Honey is a such a fun and cute place to host a bridal shower or even a baby shower! They offer Afternoon Teas and Tea Tastings for any kind of celebratory event. They have so many different flavors and types of teas to try! You can even ask to host your party on their ADORABLE patio. Such a cute idea for any kind of event or even for a girl’s day in Atlanta! We would love to partner up with your bride tribe and do a tea bridal shower or event over flower crown making. On their website they have this spot that is called: PARTEA! How stinking cute is that? If you are looking for a high tea bridal shower we think this is the spot for your bride to be. You can check out their INSTA here. You can request information on how our flower workshops and flower crown bars work in Atlanta here. Located right on the Historic Marietta Square, is an adorable and classy venue that is perfect for any bridal shower! The Vineyard Café has a great lunch and dinner menu and is the only place on The Square that offer a high tea. This is such a cute place to host any kind of wedding or baby shower and would be fun for a girl’s day or bachelorette party near Atlanta! Again, we are partial to any event space that allows you to do all the girly things like tea and flower crown making! The Mill Kitchen & Bar is located right in Roswell, GA. This restaurant is known for their cocktails, menus, and desserts. Their lunch and dinner menus are wonderful, but I especially love the brunch menu. They have a beautiful restaurant and event space that is big enough to host some wedding receptions as well as a bridal luncheon or showers. Parker’s on Ponce is in Downtown Decatur and offers an upscale, steakhouse kind of vibe. They have two event spaces: one for smaller events, like bridal showers or small parties, and a larger one for wedding receptions and big events. They are pros when it comes to events- they make the planning so easy! They have a few different prefixed menus for lunch and dinner to make the hostess’ job easier. 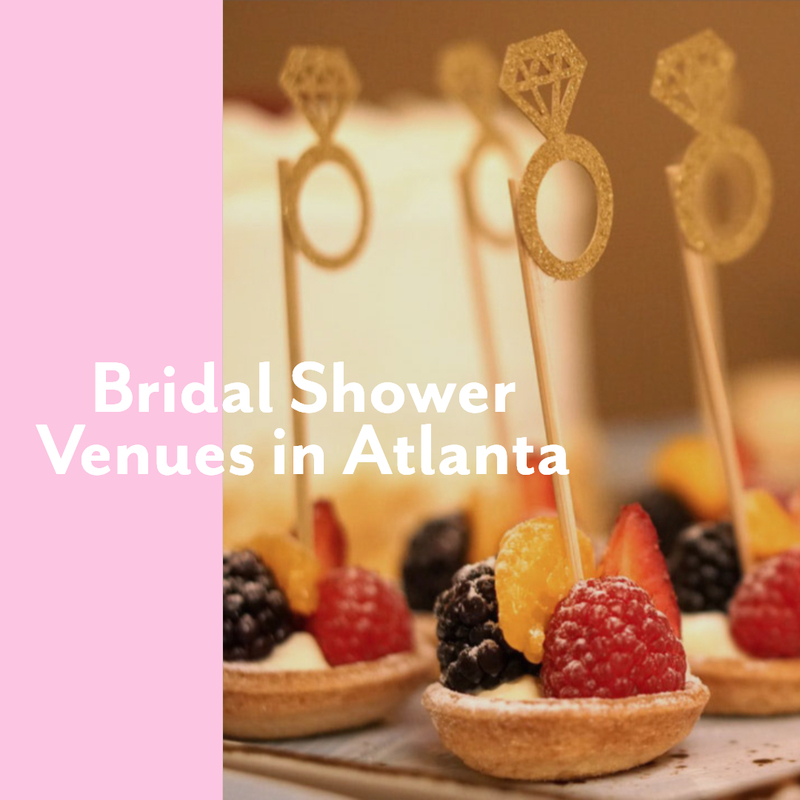 The Atlanta area offers so many places to host your next bridal event or shower. Most restaurants have great spaces for events and love to help out with the planning process. We found this really cool company called PeerSpace that allows you to put in a search the location and event type/celebration that you are looking to host. It will give you back some really great spaces that you can rent out for all celebrations you might have coming up. Good news they have a presence in Atlanta, so you are in luck! 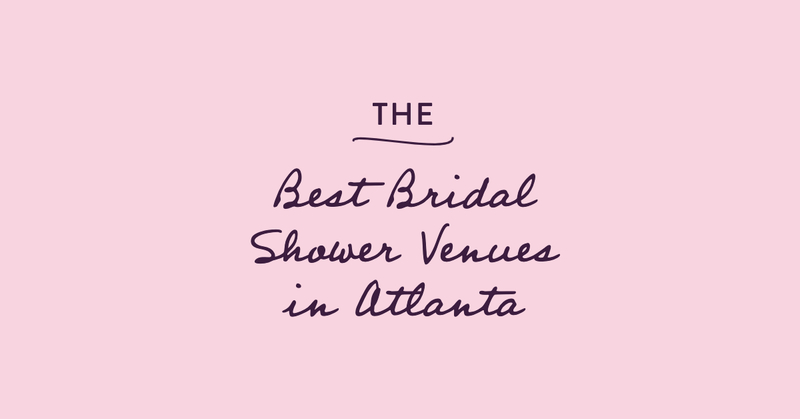 Check out their venues they have listed for bridal showers on PeerSpace here in Atlanta. We are going to do an upcoming post on fun baby shower venues in Atlanta soon too! So stay tuned on that. Most of the venues in Atlanta for bridal showers can also be great for a baby shower too and visa versa. So keep that in mind ladies! 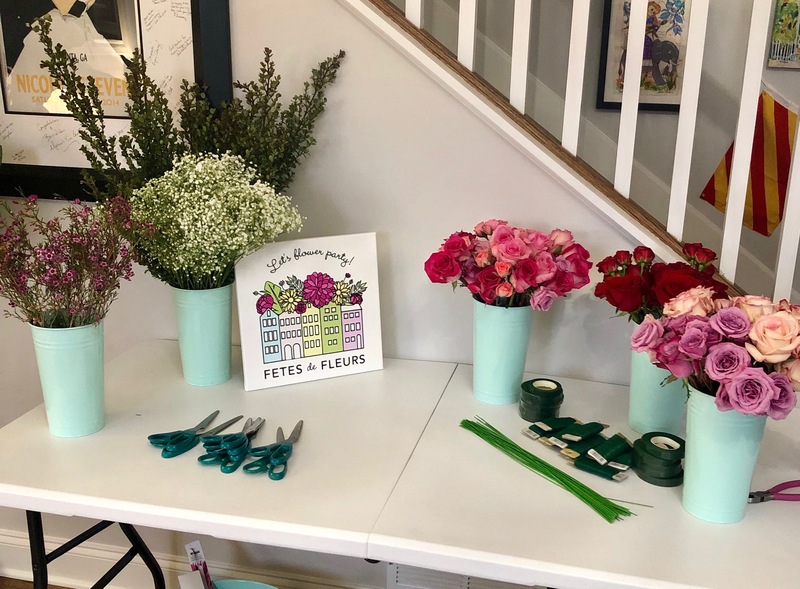 If you’re looking for a fun activity or party favors for your next bridal shower or party, Fetes de Fleurs can help out! We can bring a flower party to any venue and show everyone how to make the cutest flower crowns (or flower arrangements). It would be ADORABLE for the bride to create a flower crown with white flowers for her bridal shower celebration. 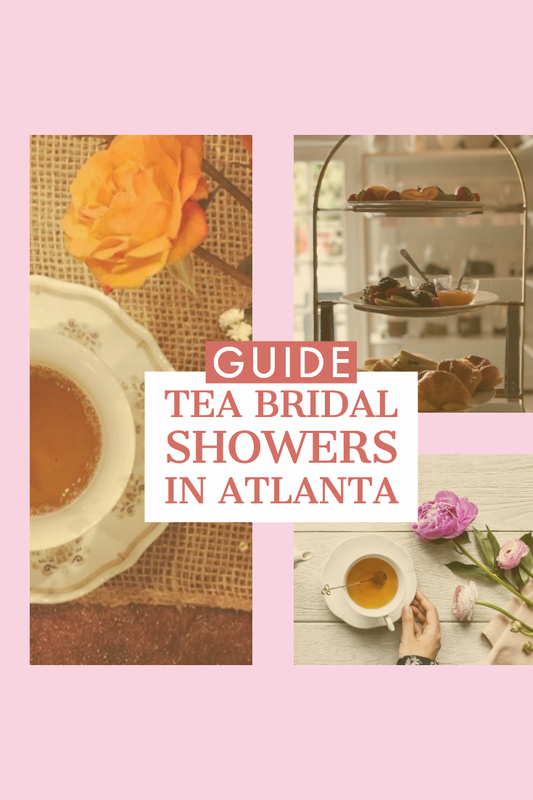 We hope you will consider these fantastic venues for a bridal shower in Atlanta or any other celebration leading up to your wedding-related celebrations in the Atlanta area. Show that you are a true #ATLien by taking a pic in front of this iconic Atlanta mural. This displays some of the things that Atlanta is known for: MARTA, Coca-Cola, and sports! Walk or drive a little further down Marietta St. towards Midtown and you will see some other paintings as well. Look for the ones near Thumbs Up Diner and Bartaco! The Krog St. tunnel connects two areas of Atlanta that are known for their artwork (Cabbagetown and Inman Park). The tunnel itself is covered in some fun and interesting graffiti and leads to some amazing works of art. The piece below is on the Edgewood side of Krog Street. 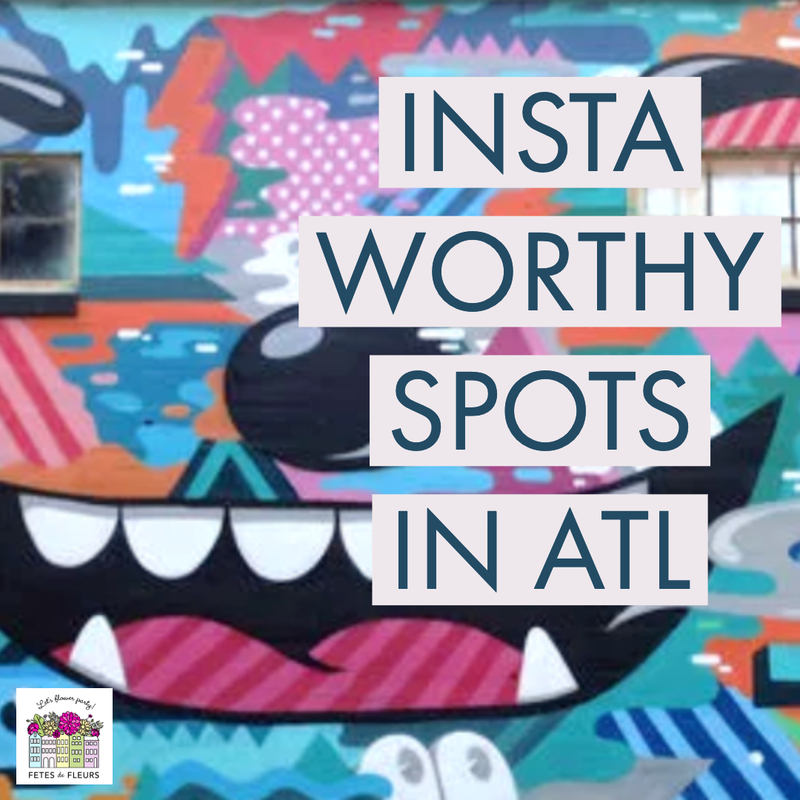 We think taking photos and exploring Atlanta's wall murals is a perfect way to spend a morning or afternoon on your girls weekend here in Atlanta or a bachelorette party in Atlanta. Ponce is an area of ATL that houses the Beltline, which is a network of trails and parks. Ponce and the Beltline are home to some great Intsa-worthy murals. One of my faves is this lion painting. Super fierce and fun! Keep walking toward Ponce de Leon Avenue for some more pieces! 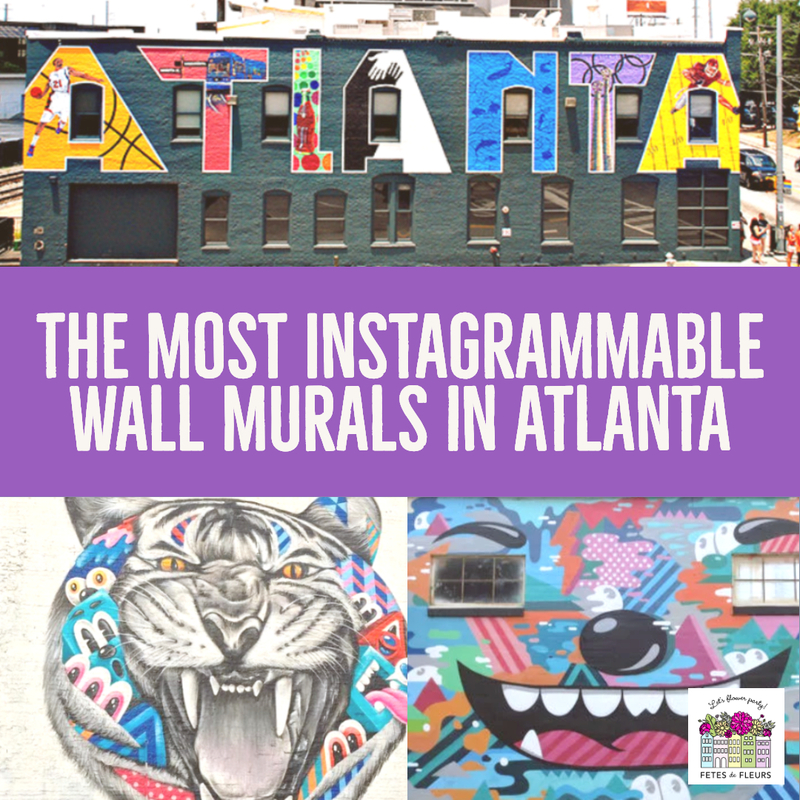 There are so many murals in ATL for you and your girls to check out! 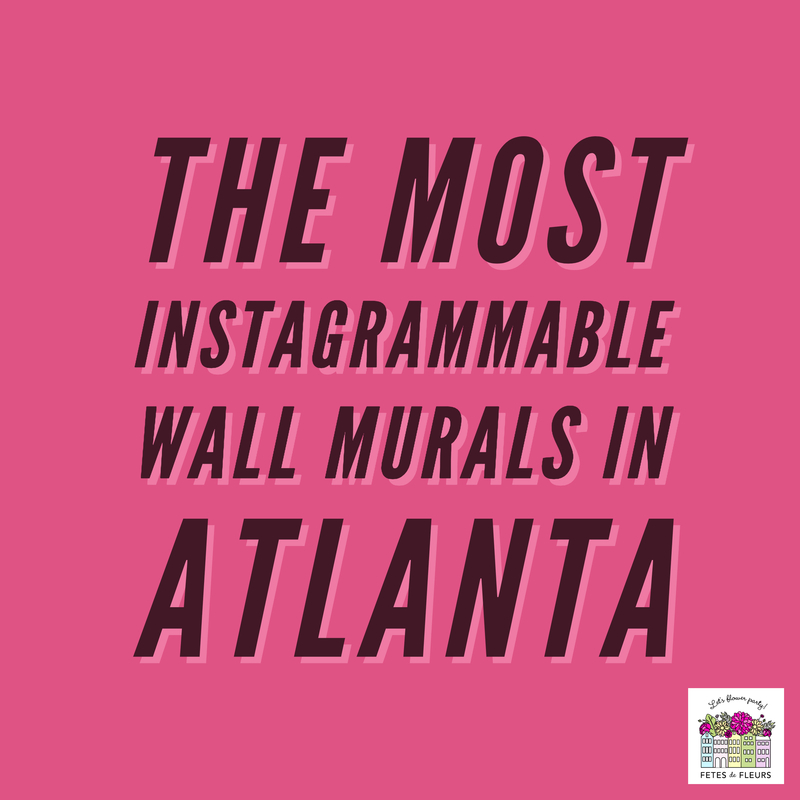 Exploring wall art and wall murals is such a huge attraction that someone created this AMAZING website that lists all of the pieces by neighborhood in Atlanta that you should check out! Check out Atlanta Street Art Map. Super helpful site and even has a map showing you where the street art and wall murals are in Atlanta that you might want to see! 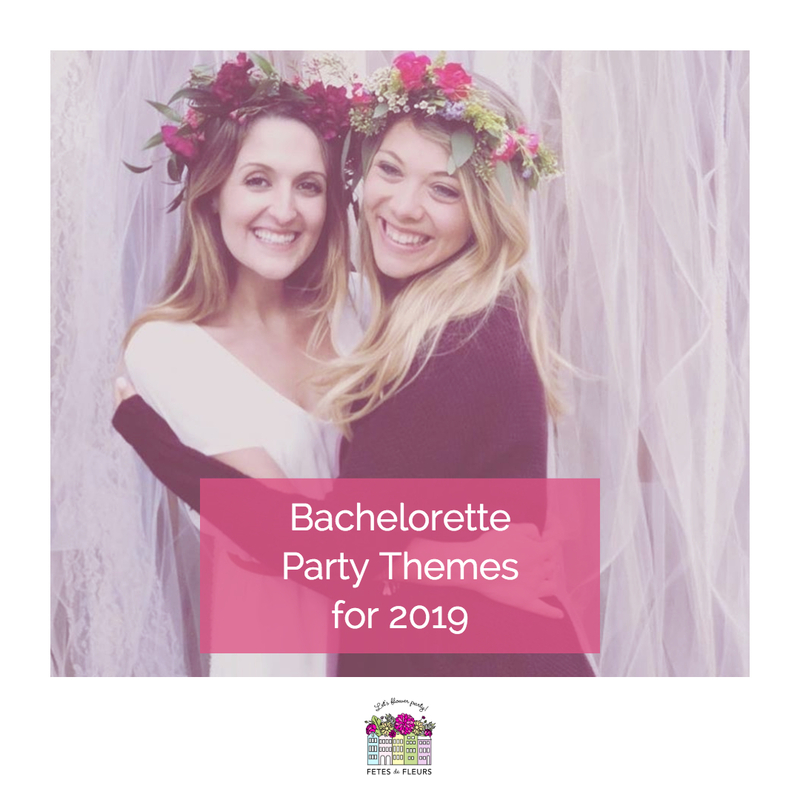 We love bachelorette party themes because it helps you to solidify the way you want your weekend to go. One of the smartest things you can do in starting to plan your bachelorette party weekend for your friend is to think about the bachelorette party theme. 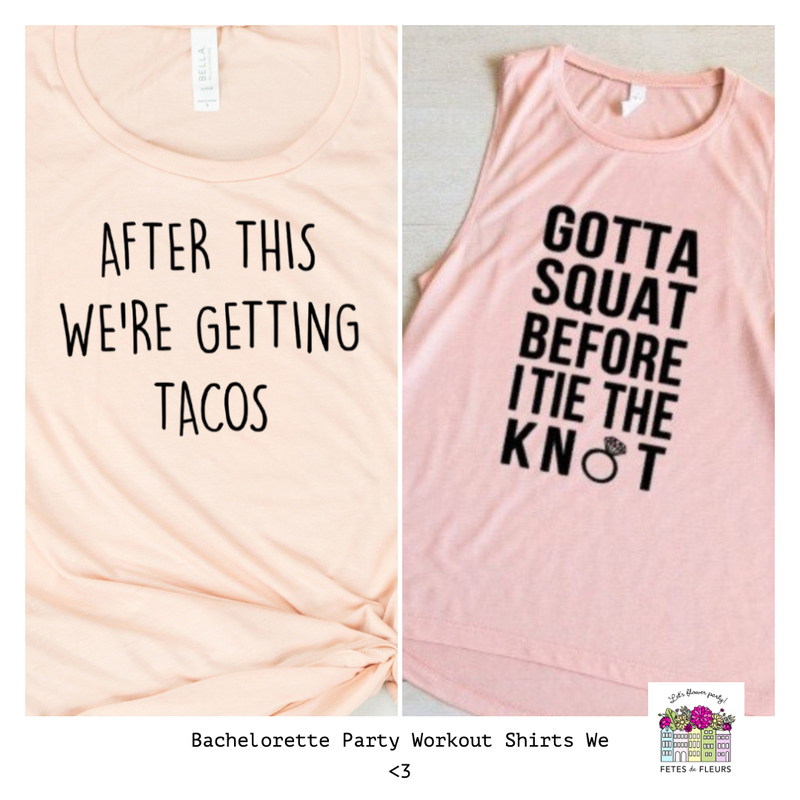 We love the "Sweating for the Wedding" bachelorette party theme. Most of our bachelorette parties and girls weekend trips do some kind of workout in the city that they are visiting and we are so happy to see that these days. A good fitness class or workout class before drinks and all the food is definitely the way to go. Then you won't feel so bad indulging all weekend. Also a good sweat with your girlfriends or bride tribe is such a fun experience. 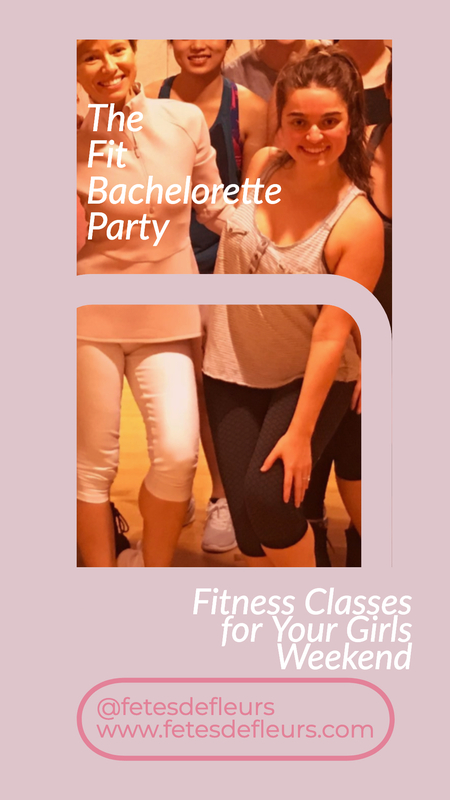 We have rounded up our favorite fitness classes in Atlanta for a fit bachelorette party theme. Pound is such a fun way to burn 900 calories and sweat the stress away—its also SO fun! The work out is a full-body cardio session with upbeat music and pounding weighted drumsticks on the floor. Sounds crazy right?! Pound has locations all across the city and each has varied class times. Flywheel has a crazy intense cycling class that would be super fun to do with your girls! The atmosphere is like a dance club with fun music and great trainers. There are two locations in Atlanta (Buckhead and Midtown). You can also choose to have your stats displayed on the leaderboard for some added competition! We love spinning and know that a lot of our bride tribes do too. So if you are a spin girl you will want to try Flywheel out while in Atlanta. I guarantee that you and your girls will have so much fun at Valeo Dance Fitness! Valeo is a group dance class. They offer a special bachelorette dance party with themes like Beyonce and Magic Mike! How perfect is that? We would love to partner up with you when doing the dance class. We could come there to help you make flower crowns or deliver you flower crowns for after your class to take photos. You can request more information on how our flower workshops work here in the Atlanta area. Check out their instagram here to get excited for a dance class while in Atlanta. Body Jump Fitness is a FUN studio located in the north metro Atlanta area. This studio does high-intensity trampoline fitness classes. The entire workout is done by jumping at different intensities on a trampoline. You can even book a private class for your bachelorette group! Go get your jump on and then book a flower crown workshop with us post class. Highland Yoga is a heated power yoga class. They believe in the idea that good things come to those who sweat, so they heat their studio to 93 degrees and do a very vigorous yoga class! 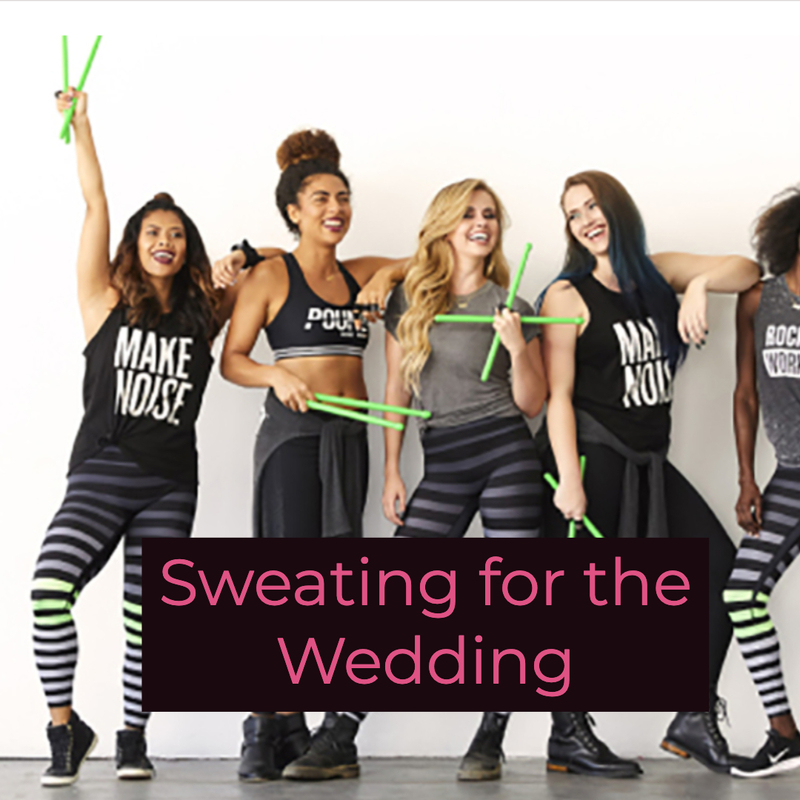 This one is perfect if you are looking to really sweat out the stress before the wedding! Yoga and flower crowns always go hand in hand for bachelorette parties. So grab your bride tribe and get your yoga on with flower crowns. 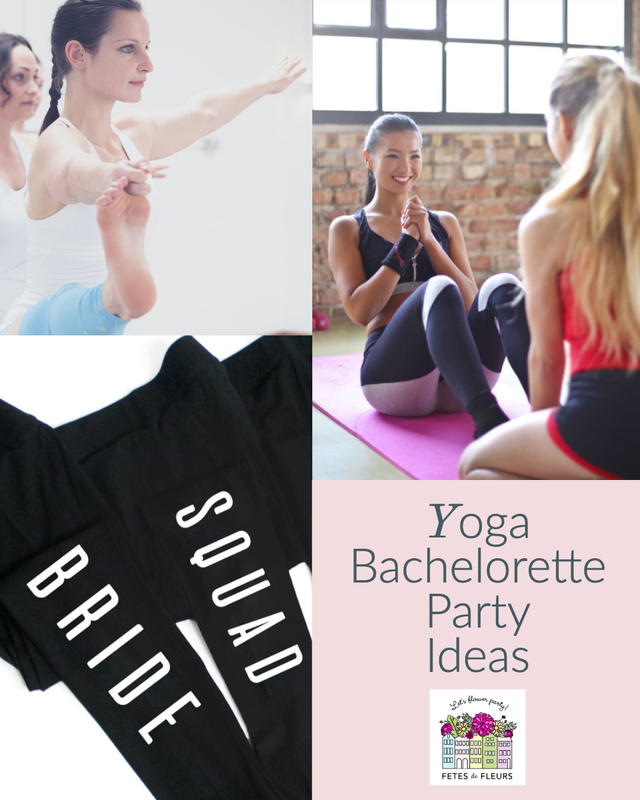 If you are looking for chill or relaxing bachelorette party theme- yoga and flower crowns might be just right for your group. Chaos Conditioning is a high intensity strength training workout! They host Club Chaos every Saturday night where they turn the gym into a club and workout to music from a DJ and disco lights. This place is so fun and is sure to provide a good workout! Atlanta is packed with some unique and fun workout classes. From yoga to cycling, the options are endless! 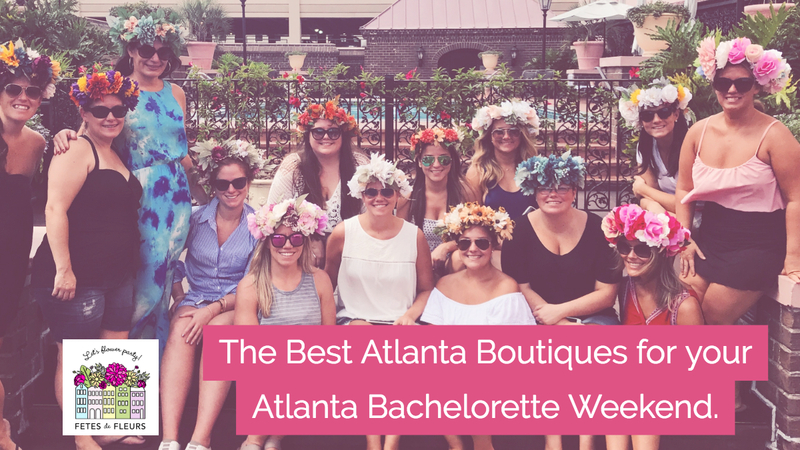 If you’re looking for something different and full of energy to do while on a bachelorette party or girls’ weekend in Atlanta, then you HAVE to check these places out! There are also some great parks in Atlanta that do open classes on the weekends, which are super fun. If you and your girls are more into relaxing with a pedicure or a massage, check out my post about the best spas in Atlanta! Either way that you decide to celebrate, you cannot go wrong with penciling in a couple of hours for a custom flower crown party! These parties are so fun and are a great way to spend some quality time with your gal pals. 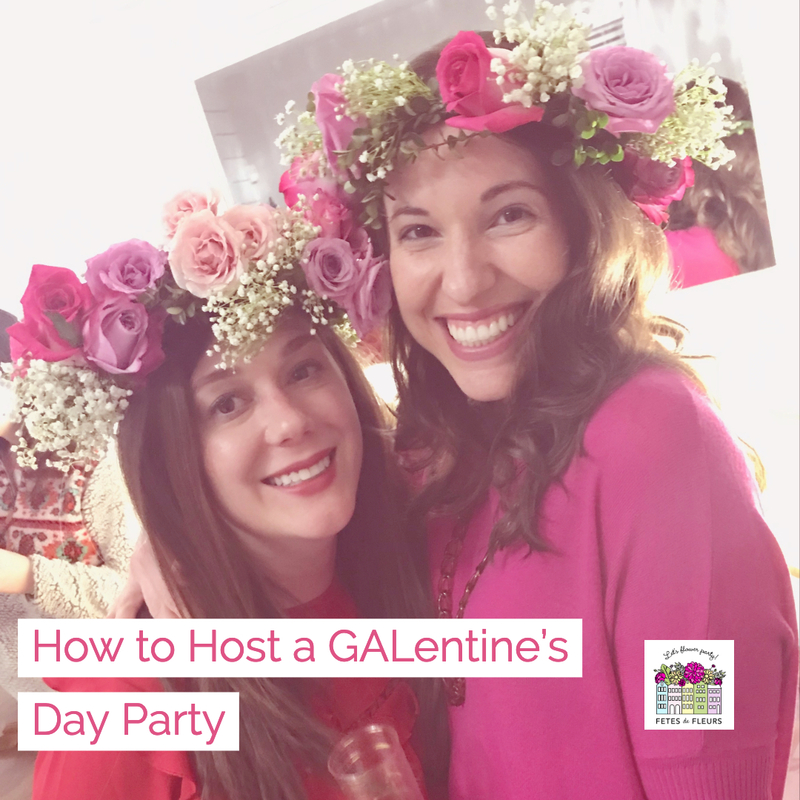 You can check out this recap on a Galentines Day themed flower crown party and see what we’re all about! Chateau Elan is located in the northern part of the state and is a MUST see. They have a luxury resort and an award- winning winery. The grounds are full of beautiful views, great restaurants, and a relaxing health spa. This is perfect for a nice day trip or you can even stay in the resort. They have daily wine tastings, tours of the winery, and other events and classes. It would be SUPER cute to bring your handmade flower crowns to the winery and wear them during the tasting or tour! We love flower crowns and vino. They seem to go perfectly together. Just a few miles north of Atlanta is one of the prettiest and busiest lakes. Lake Lanier is the perfect place for you and your girls to spend a day soaking up the sun during Georgia’s hot summers! There are so many things to do from boat rentals, lakeside restaurants, and even a water park. (Yes, a water park). Recently, Jimmy Buffet’s Margaritaville came to Lake Lanier and opened a restaurant, beach area, and waterpark. Lake Lanier also has some other great restaurants and resorts that would make for a fun bachelorette party or girls weekend. If you’re coming to Atlanta for a summer bach party, be sure to check out Lake Lanier and all that it has to offer! Marietta is a historic city in the Atlanta suburbs. In the center is the FAMOUS Marietta Square. The Square is known for its unique and delicious restaurants, quaint little shops, and weekend events. There is always a festival or event at the Marietta Square—from Chalktoberfest to the Taste of Marietta there is always something fun to do! This would be such a fun spot to go check out while you’re here for a party or girls’ weekend. If you and your girls are looking for more adventure, you have to check out Amicalola Falls. Amicalola Falls is the highest waterfall in the state! You can walk up the 600+ steps to see the BEST view (trust me…it is SO worth it) and on the way to the top check out the beauty of this waterfall. To reward yourself after the workout, you can go to The Maple Restaurant where you can enjoy some great food and another beautiful view. Atlanta is such a fun city with so many things to do a see, but sometimes it is nice to venture out of the city! Hope these day trips out of Atlanta help you to plan a relaxing and fun (or adventurous) party on the outskirts of ATL. If you’re looking to party in the perimeter, check out this post on fun things to do in the city! Either way that you plan to party, Fetes de Fleurs can help you add an extra cute, girly flair! We can bring our flower crown bar to your hotel, Airbnb or event space and show you how to make the cutest flower crowns. These are perfect to wear on a day trip winery tour or to a bachelorette brunch! 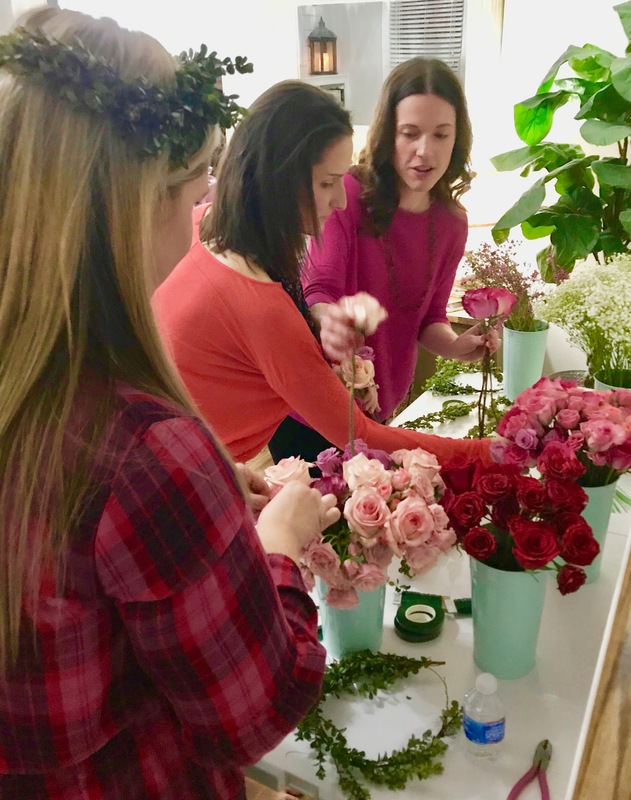 You can request more information about our floral workshops and flower parties here for the Atlanta area. We hope to flower party with you soon here in Atlanta. Atlanta is becoming one of the top destinations for bachelorette parties or girls’ weekends. There are so many things to do and lots of things to see…and places to eat! I’ve made the planning easy for you by listing out some of Atlanta's best restaurants for dinner. All of these places have the best vibes and even better food! We made sure to write out restaurants that are good for options for all kinds of bachelorette groups. So if your group is fancy and wants upscale options for dinner reservations you will find those below. We also listed out our favorite spots that double up for dinner and entertainment in one location. Last but not least, you will find out list of our favorite Mexican dinner spots for your Altanta bachelorette group. If you’re looking for an upscale, classy place for dinner, the restaurants below are perfect for a group dinner out in Atlanta. They each have great dinner and drink menus and would be perfect for a bachelorette party dinner in Atlanta. Here are our favorite upscale dinner places for an Atlanta Bachelorette Party Group. This place is super cool and offers a lot of different options for a bachelorette party group. Check out their book a party part of their website to see what we mean. They have a courtyard where your bachelorette group can look up at the night sky while enjoying drinks and great food celebrating the bride to be. There is a retractable roof there and we love those things. Don't you? They also have a patio area with an "urban garden" as well as bocce ball. We love options like that. There is also a private dining space if you are looking for something a bit fancier for your bachelorette party needs in Atlanta. You can follow along on Two Urban Licks instagram here. We love 5Church in general. We have one of these in Charleston, SC too! They are such cool spots for a group bachelorette party and we would love to see a flower crown group there. They have a really cool menu and cool vibe. 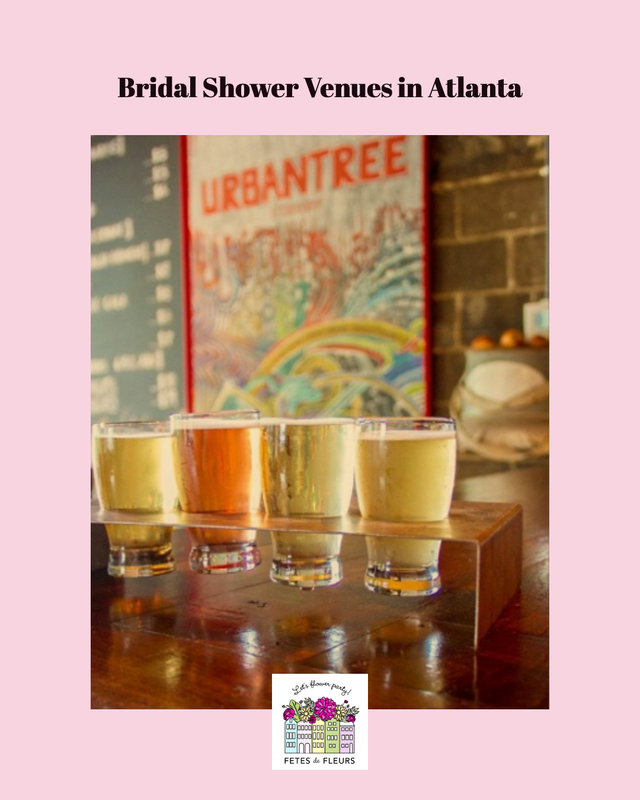 So if you are looking or a hip place that is really cool all around we definitely would recommend checking this place off your list while celebrating your bride to be in Atlanta. This place is tucked away along the Chattahoochee River. This place is known for fine dining with an award winning ambiance with beautiful gardens for you to explore. 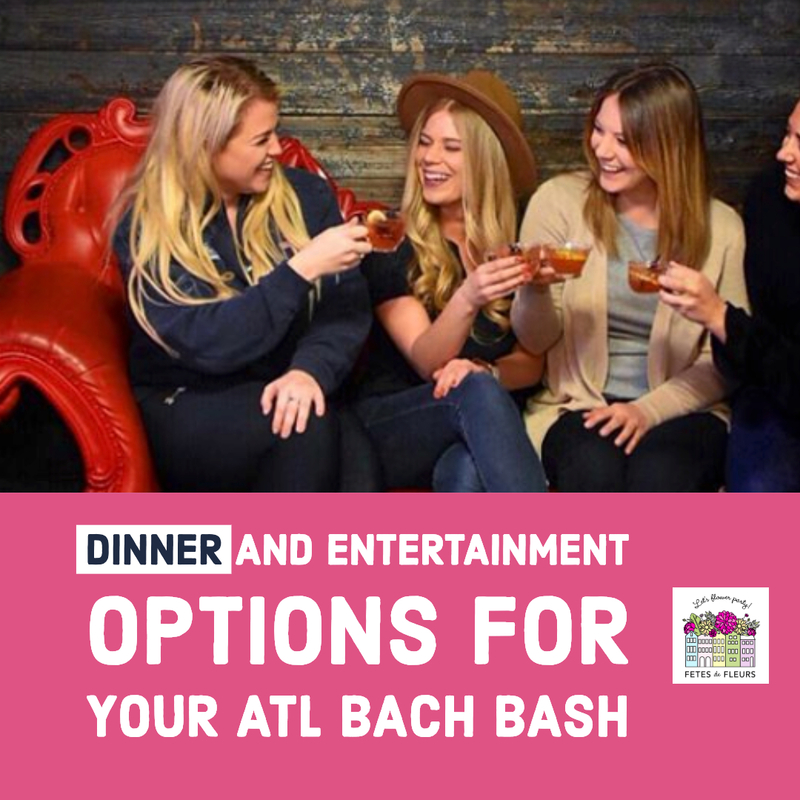 This is definitely a good option if you are wanting a place that is really nice - maybe for your nice night out that you are planning on your bachelorette party trip to Atlanta. Enjoy great cocktails or a glass of wine while waiting for your table outside overlooking the river. There are such pretty gardens too which we obviously love here at Fetes. This is a true southern eatery. 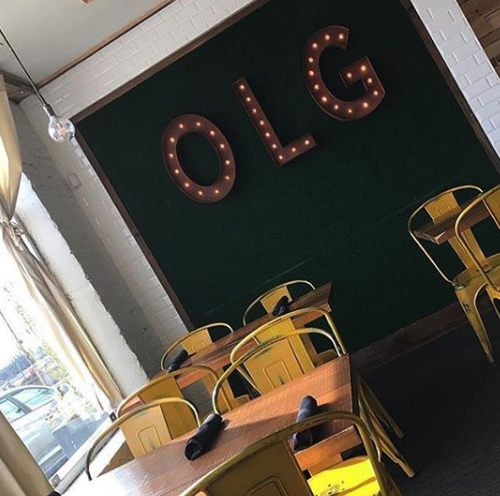 You might have seen this restaurant on Bravo's Real Housewives of ATL. This place is super cute and we love the food here. Great drinks too. Check out their INSTA here. Seven Lamps is located in Buckhead area of Atlanta. They have a super cool option for your bachelorette group dining where you can book a coursed out menu here. You can pick from a 3, 5 or 8 course dinner option. We love this idea if you are looking to do something a bit more unique for one of the dinner reservations for your weekend in Atlanta. 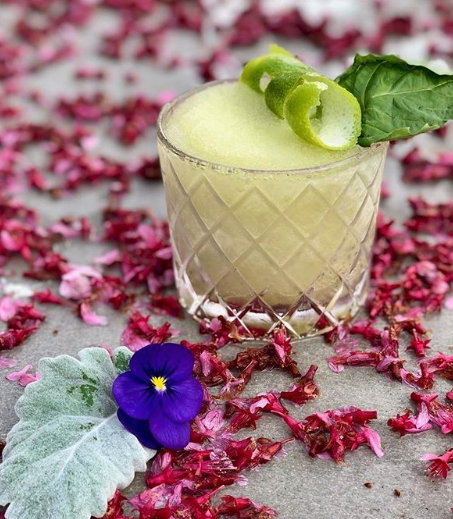 We also love pretty cocktails with flowers and they have plenty of those options here. Atlanta has some great dinner spots that offer some sort of entertainment on top of the food and drinks. We have found some of our favorite spots that double up on entertainment and dinner from bowling to dancing. We guarantee that you and your girls are going to have so much fun with these spots. Here are some of our favorite places in Atlanta where you can double up on dinner and entertainment for your night out on your Atlanta bachelorette party. Located in The Battery Atlanta entertainment district mere steps from SunTrust Park and Coca-Cola Roxy, PBS Atlanta has what you need to take the game to the next level. With 25,000-square-feet of sheer awesomeness that includes 3 bars, virtual reality, ping pong, billiards, bowling, classic arcade games, craft bevvies and kickin’ food, you may not want to leave and we wouldn’t blame you. Come on people - it’s game time. 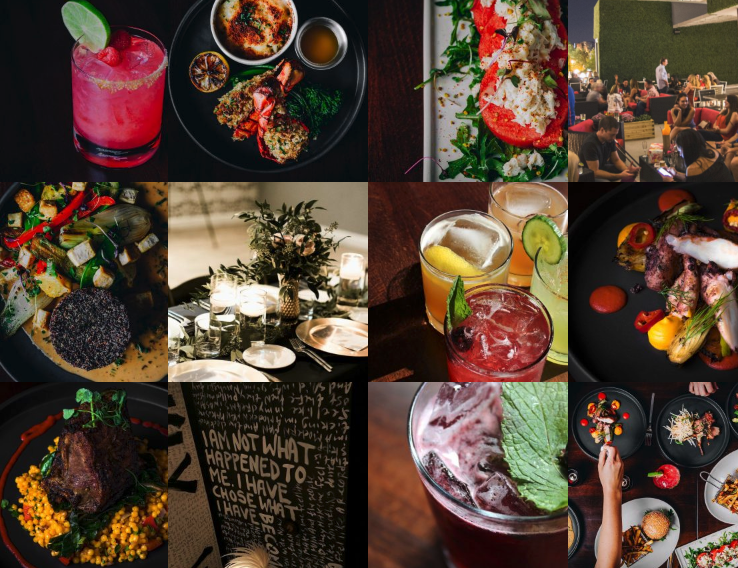 Check out their insta here to get inspired for a fun, group dinner out in ATL. This is an upscale boutique bar where you can bowl and have dinner and drinks all at the same time. We love any place where you can have activities for your night out and get dinner. Kill two birds with one stone at one cool place like this. This place is in Buckhead in an industrial warehouse. There are 20 full service lanes for bowling - so get competitive ladies and get your bowling on. On top of bowling options you can also play games. We love places with games and bowling. Sounds super fun to us! Think bocce courts, shuffleboard, ping pong tables, darts, giant jenga, etc. We love games for a bachelorette party addition. You can check out Painted Pin's instagram here. Okay ladies, you have to go here!!! This place is known for their bachelorette parties in Atlanta. You can check out their shows that they offer on their website here. 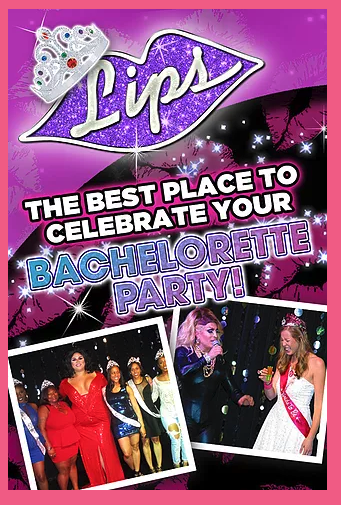 Depending on which night you are planning to do this there will be different show options for your bachelorette group in Atlanta. We think getting your bride to be up on the stage with the divas will be a perfect way to spend your night out. Just make sure you wear your flower crowns from your flower crown workshop to the show and send us your photos! This place is known for their burgers and bar food. So if you are wanting a more relaxed and maybe not super expensive option for a dinner maybe pick here. They also have fab libations and cocktails to pick from too. You will definitely have a super fun time here and won't leave hungry either. If you and your girls are into tacos and margaritas, these are the BEST Mexican restaurants to go to! These mexican spots have a fun atmosphere and some of the best margaritas in Atlanta. 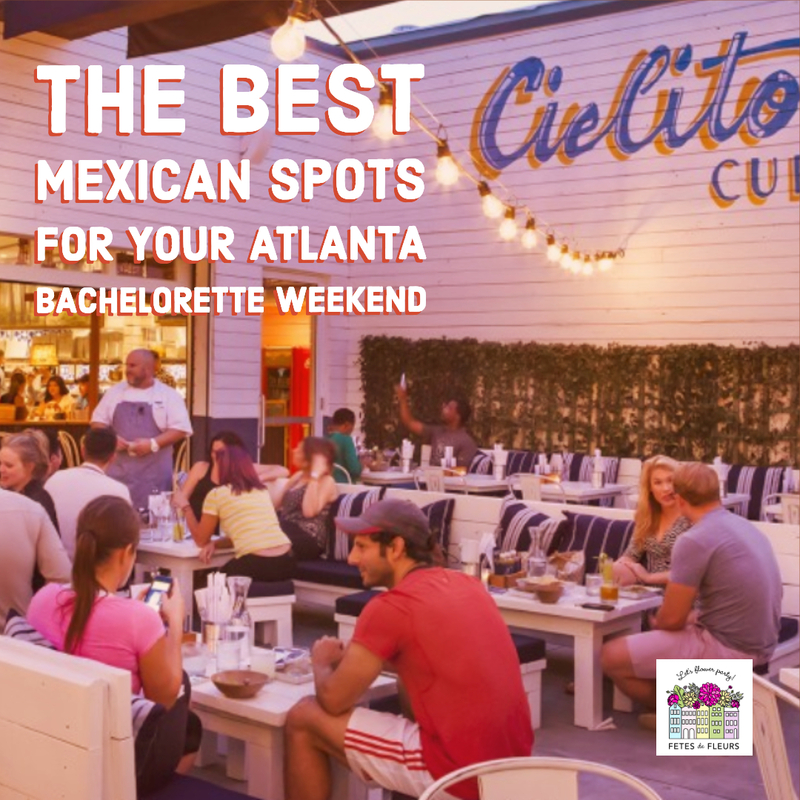 Here are our favorite Mexican spots for bachelorette parties in Atlanta. We are huge Bartaco fans in general. Any city that we go to that has a Bartaco we want to go to. Think beautiful decor that your bride tribe will love plus the perfect sized tacos to munch on with great margs. We can't think of a better spot for a group dinner than Bartaco. They also have multiple locations in the Atlanta area. Go get your margarita on, ladies. Let us know what margarita and taco are your faves too! You can check out their margs on their instagram here. 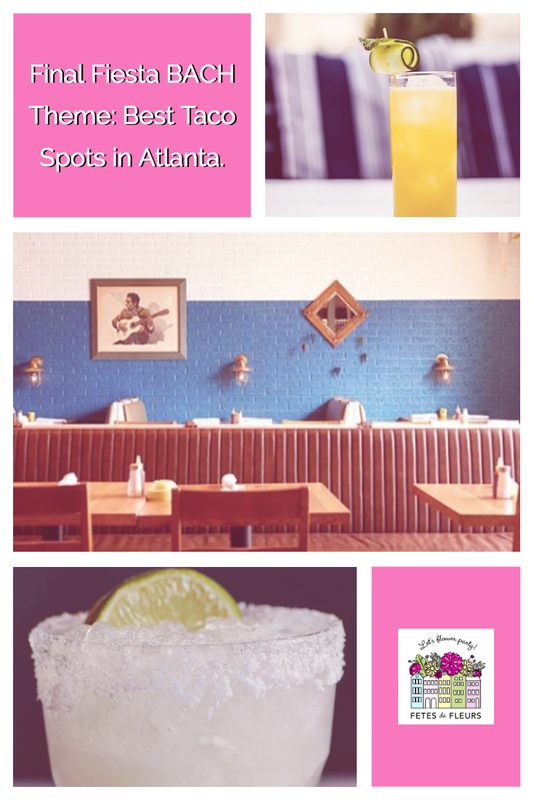 If you are addicted to tacos then you must make a stop here while in Atlanta for your bachelorette party weekend. This place is not your typical Mexican joint. They combine fresh local ingredients with home made sauces that are oh so good! They have amazing margs too which is typically how we decide we want to spend time somewhere. 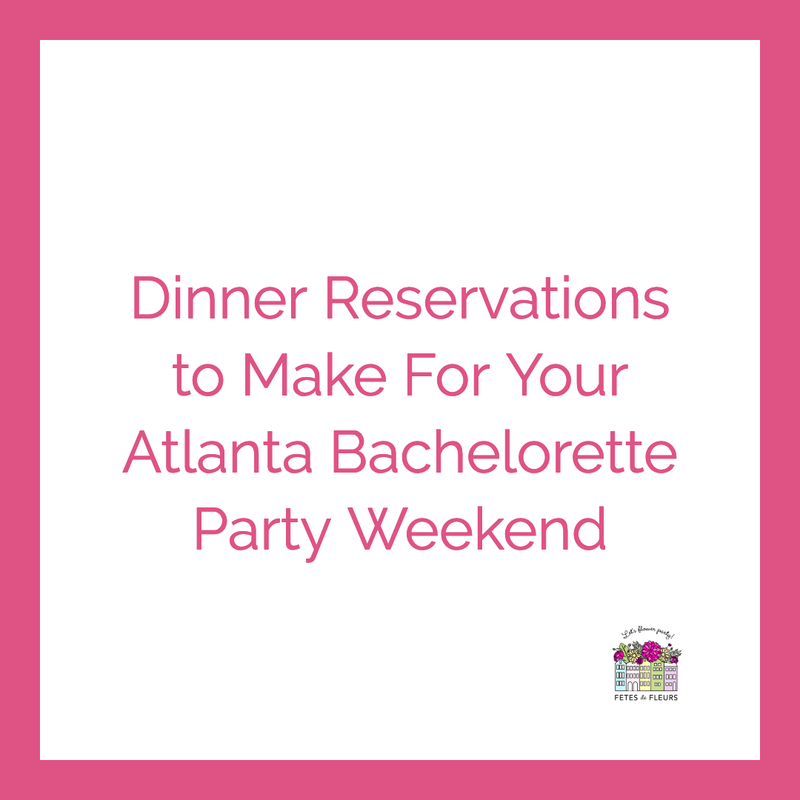 Atlanta is packed with some great restaurants for you and your girls to try while here for your bachelorette party weekend. There are so many to choose from, so I hope that this helps narrow down the options a little bit. Check out my other post about the best brunch spots in ATL for some more great restaurants to try for your breakfast and brunch needs too. 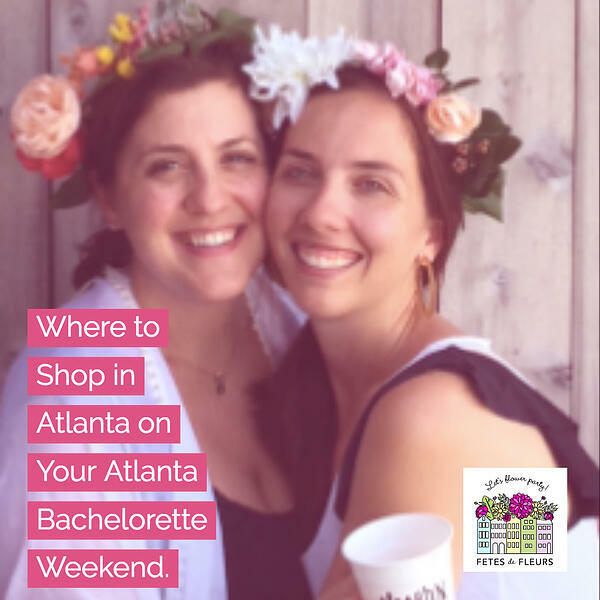 We are also happy to setup a flower crown workshop for you ladies at an Atlanta brewery as part of your weekend in Atlanta or if you are looking for local things to do as locals in Atlanta with your girlfriends we can do private flower parties for you. Just request more information about how our Atlanta flower parties work here. We come to you! You don't need to do a thing other than work with us on the date and time. Just get your girlfriends together and we can bring a fun, floral activity to you for a night out on the town. Thrillist also has a super helpful list of the best Atlanta breweries on their site here. We also found that Eater Atlanta also has a helpful article about drinking beers at Atlanta breweries here too. Orpheus is known for the sour brews- which are my fave for the hot summer days in the ATL. Wandering Blues is one of my favorites! They have a really awesome view of Piedmont Park and a great tasting room. Check out their Instagram here! Out in Decatur is this really cool brewery! They have a laid back vibe and different types of beers. They’re Emergency Drinking Beer has become an Atlanta favorite! They host a lot of community events, including yoga classes on Saturdays which could be fun to do in combo with a flower crown workshop. We love bachelorette groups and local ladies having fun with yoga, beer and flower crowns. SweetWater 420 is the STAPLE Atlanta beer! This brewery could be one of ATLs most popular-and for good reason. They have a really great deck area with music that is perfect for spending the afternoon jamming away and drinking some good beers outside. They even host a festival called “420 Fest” in April where they have live music! Click here to check them out! Any festival with flower crowns is a good time in our books. Three Taverns is located on the Eastside of ATL. They are known in Atlanta for their, "A Night on Ponce IPA", which has some great citrus notes. They recently have produced some sours that have become just as popular. The brewery has a really cool, tavern-ish vibe that is perfect to spend time with your girls! These are just a few of my favorite breweries in ATL- there are so many more to check out while you are in town. Some other must-see places are Red Hare Brewing, Monday Night Brewing and Scofflaw. You can also check out Southern Beer Tours. They have public and private tours of some of the best Atlanta breweries. 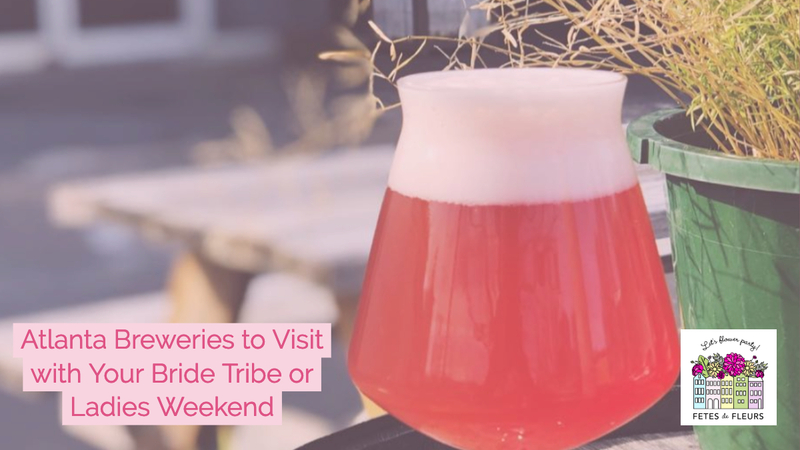 What better way to celebrate bachelorette party or a girls’ weekend in Atlanta than with some good brews and a flower crown workshop! Fetes can add an extra cute touch to any party or activity with flower crowns. We can bring the flower crown party to you before you all go out on your brewery tour- how cute would it be to wear your crowns on the tour!? 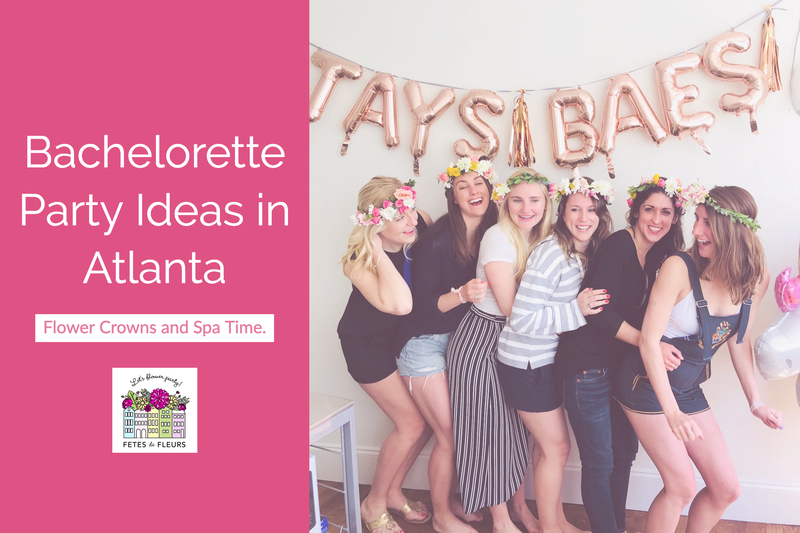 Check out our Atlanta bachelorette party guide for more fun things to do and places to visit! You can request more information about how our Atlanta flower crown parties work here. We hope to flower party with you soon while drinking some good beers! Here is Summer and Spring up ahead. These lovely ladies had such a fun and memorable Galentine's party complete with yummy snacks, girl time, and of course flower crowns! This was such a fun activity for these girls to do while they were catching up and having fun with their friends. 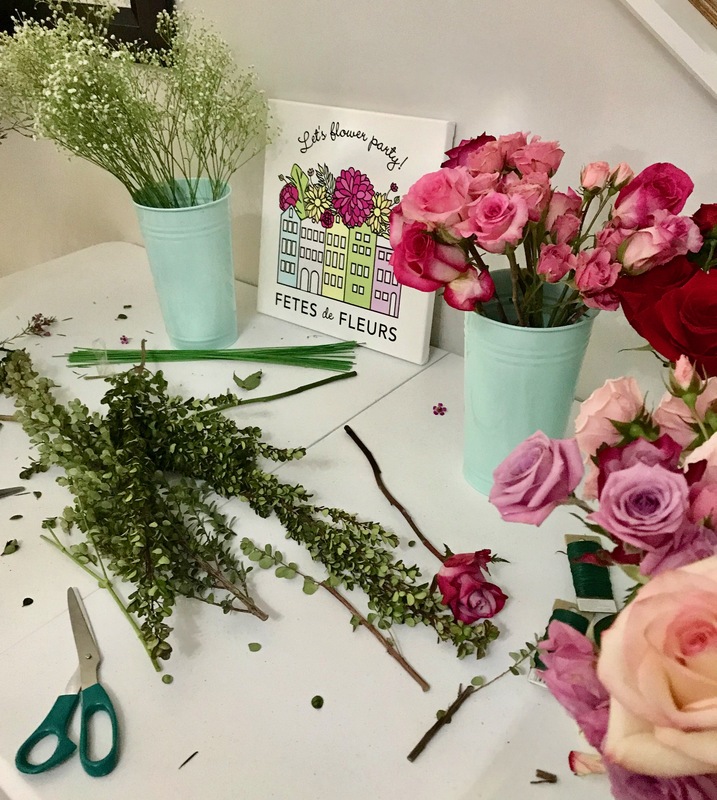 Fetes de Fleurs can show you how to make flower crowns with either real or silk flowers, depending on what your group wants to create with. You can also choose what color or color scheme you’d like to follow and we will bring the prettiest and best flowers for the party based on your suggestions! Fetes brings everything needed to create a flower crown, so you just have to bring your best girlfriends together and be ready to learn a new floral skill! 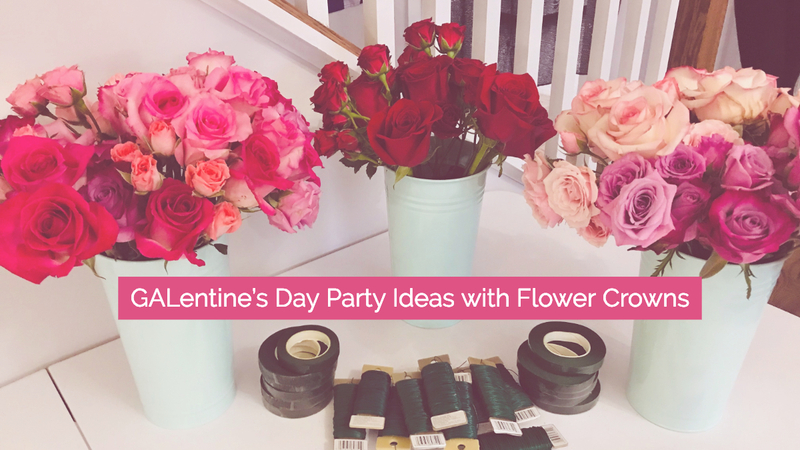 For this party, the girls decided to use real flowers in pinks and reds-- perfect for their GALentine's Day theme. 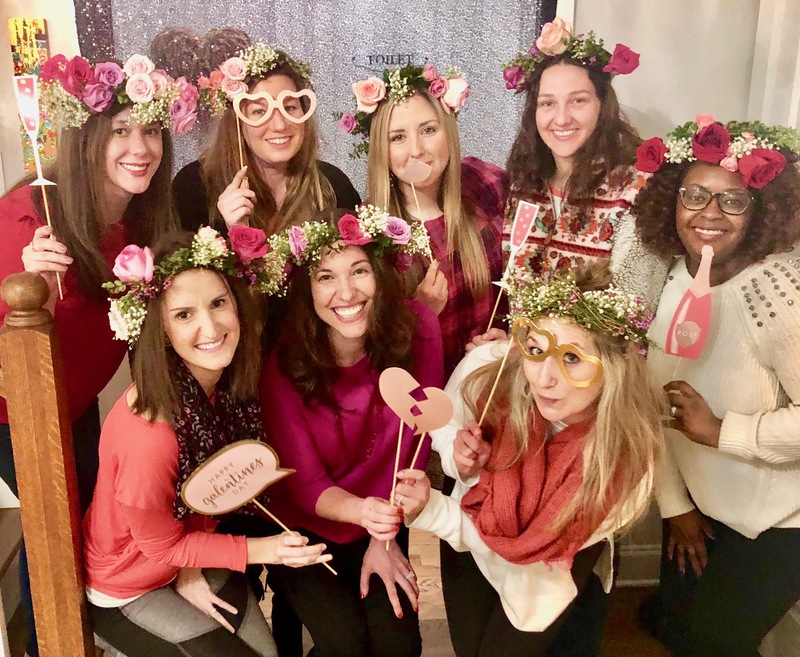 We love the idea of using pink and red flowers around Valentine's Day so we were super excited to flower party with this Atlanta group of friends. Once all of the girls had their champs in hand, we began creating our flower crowns! We started with adding greenery around the base of the crown- which I think adds a little extra to the crowns. Next, the real fun began...adding the flowers! We had roses in pinks and reds and some really pretty baby's breath, which is perfect to add a girly flair to the flower crowns! Each of the girls had their own style that they were going for, all with different patterns and color schemes. 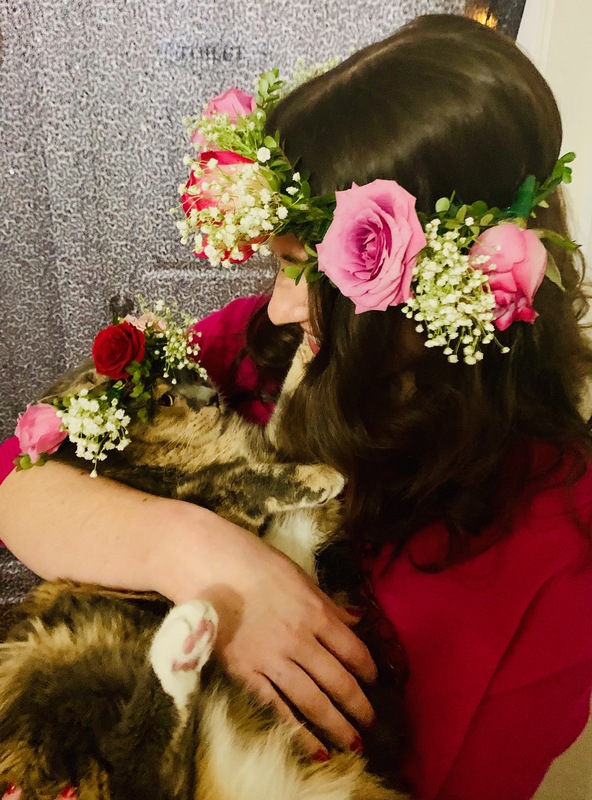 An extra guest showed up to flower party with us, so naturally we had to make a custom crown for her! Check out the cutest little flower crown on this cat below. It was so exciting to see everybody’s finished flower crowns and how impressed they were with their own creativity and skills. A lot of groups will tell us in the booking process that they are not crafty or good with things like this. We PROMISE you it will all be a-okay. We are going to teach you everything that you need to know to make beautiful crowns and learn a new skill to boot. We will help you as much as you want too. 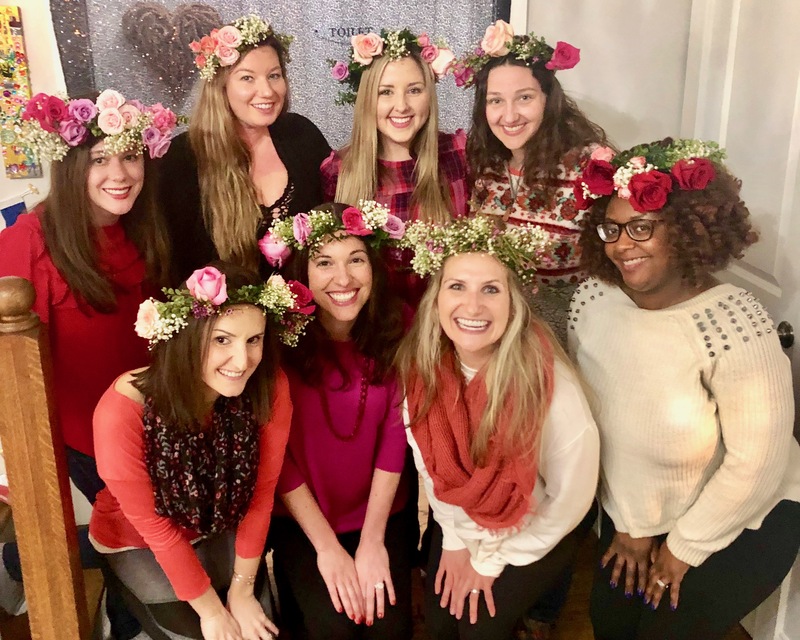 The flower crown workshop was such a great way for these girls to get together and catch up and that I was so thankful to be a part of their Galentines party fun! These ladies definitely know how to throw a party and were the perfect group to help establish Fetes de Fleurs in Atlanta! 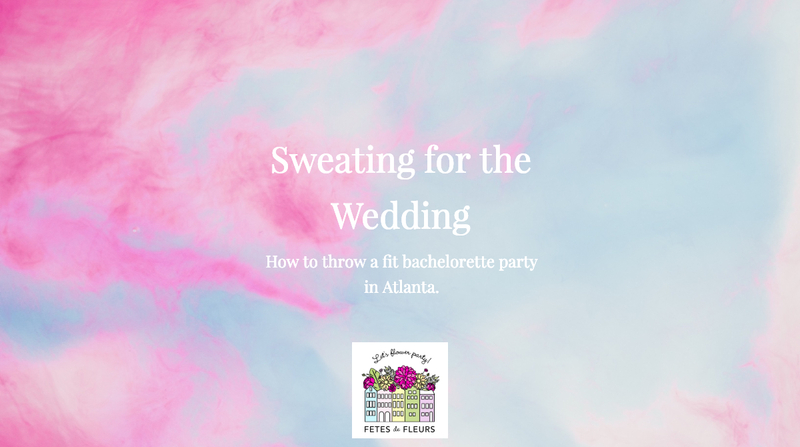 If you are looking for a fun activity to do for a bachelorette party, bridal shower, or just for a fun get together with girlfriends, Fetes de Fleurs Atlanta should be you go-to! We bring the party to you- wherever that may be (at your Airbnb, house, or venue) and provide all of the supplies to make this an easy and fun event for you and your girls. 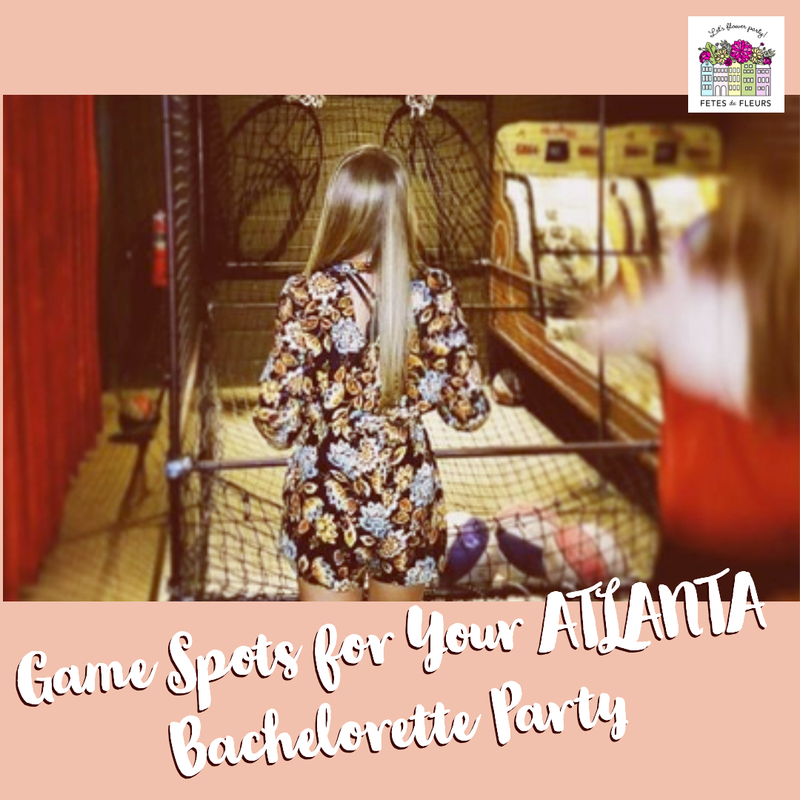 You can also check out our Atlanta Bachelorette Party Guide for more ideas on how to celebrate in Atlanta. Thank you to all of these ladies for letting me be a part of your fabulous Galentine's Day Party! It was so much fun and was a great way to kick-off Fetes in ATL! Thank you for having us and hope you had fun learning how to create flower crowns with us. One of the best worldwide skincare brands, Bliss, has two spas in Atlanta. Bliss offers a variety of facials, body massages and treatments, and nail treatments. This is the perfect place for a blissful girls trip! We love Bliss Spas in general here at Fetes. 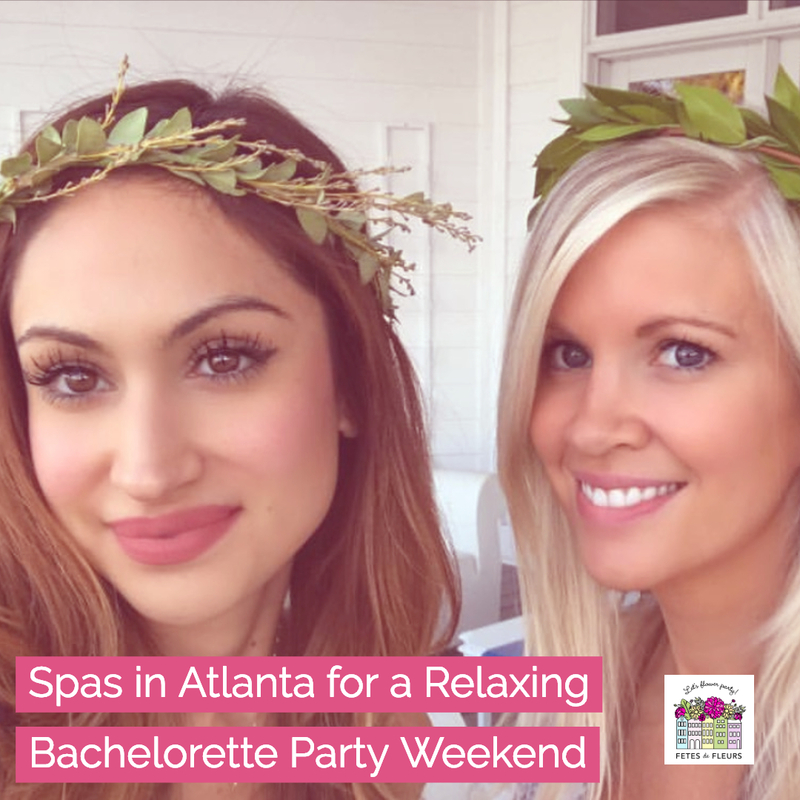 They have the cutest selection of services and treatments that we know any bachelorette party group would love to do as part of their weekend in Atlanta celebrating. We love the idea of doing mani-pedis and/or some massages to kick off the weekend or even wind down the weekend. We would be happy to get you flower crowns as a part of a spa bachelorette party too. Just think how relaxed you would be after some services here at Bliss and then you could put your flower crowns on that you made or that we made for you! Natural Body Spa has multiple locations all across Atlanta. They offer really great spa day packages that you and your girls are going to love! One option is 4 hours of massage with a body facial and a mani/pedi option for about $400 (and also includes lunch!) This place is perfect for a full day of R&R! Lark & Sparrow is a natural and organic nail salon in ATL. It is one of the most relaxing nail salons in the city and it is reasonably priced! Make sure you stop here to get a fresh mani before your bach party heads out for dinner! Check out some of their cool nail designs on their Instagram. The Posh Spot is a salon/spa where you can get a massage, facial and manicure at one spot! The vibe is so calming and soothing and is the perfect retreat for your girls weekend. They offer various packages that are a great deal. These are just a few of some of the best spas and salons in ATL! They are perfect for a relaxing spa day or prepping for a fun night out on the town. 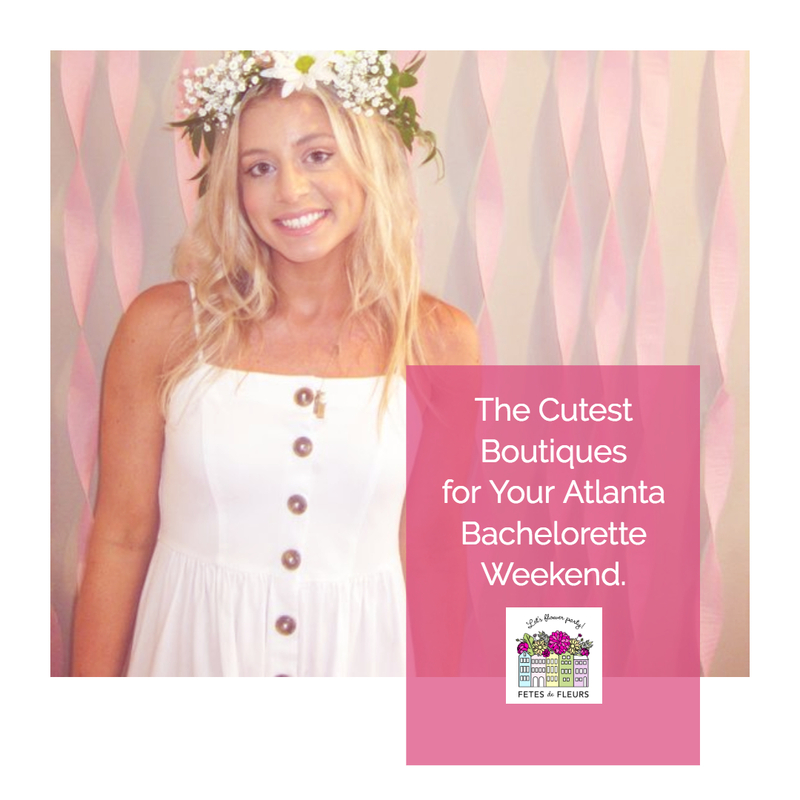 Either way, be sure to add flower crowns to make your Atlanta bachelorette party extra cute and special! 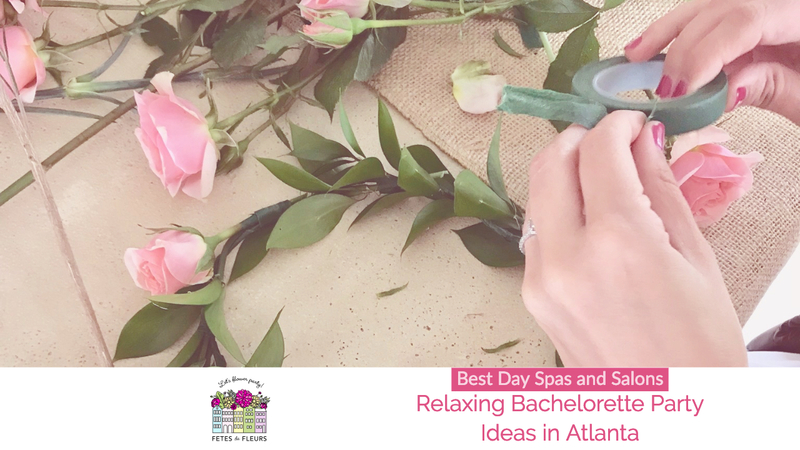 If you are looking for a relaxing bachelorette party in Atlanta we highly recommend spa time and flower crowns. People tend to tell us that making flower crowns is actually pretty relaxing so adding that in as an activity is a great idea. We can bring a flower crown making party to you, so that you and your girls can make their own. 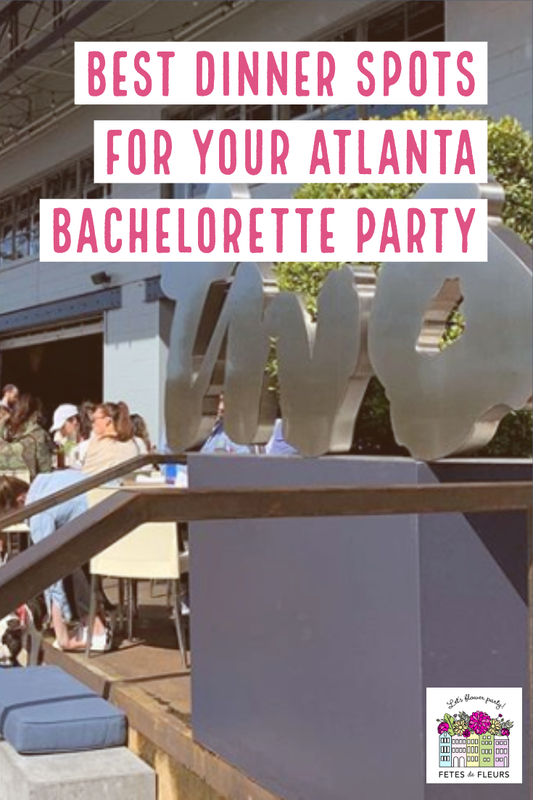 Be sure to check out our Atlanta bachelorette party guide for some more fun things to do while you’re here on a bachelorette party or for a girls weekend! Atlanta is the best place for girls that can shop for hours! Below are some of Atlanta’s best boutiques to shop at. Grab you girls, comfy shoes, and lets get shopping! We can't think of a better way to spend some of your weekend in Atlanta than getting some shopping in at the best boutiques that we love here in our city. fab’rik is a women’s clothing boutique. They have everything from casual to dressy clothes and accessories! Fab’rik strives to have stylish and trendy clothes with reasonable pricing. They have multiple locations in ATL so be sure to check them out! 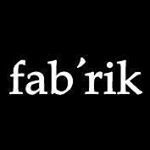 You can keep up with them on their Instagram @fabrikstyle. Dress Up is another hip and trendy boutique in Atlanta! They have about 10 different locations across the Atlanta area- including one in The Battery at SunTrust Park. Their clothes are always on trend and are reasonably priced. Personally, I love their selection of shoes! Check out their website to see all of their clothes and locations here. You can also view their Instagram here. I always see influencers and bloggers posting about the clothes they get from Dress Up so make sure you stop into one of their locations. They also have great stuff on their website that you can buy from anywhere too. Swoozies is as fun as the name sounds! This is a fun little gift shop in Buckhead. If you are looking for party decorations, gifts, or personalized items- you NEED to go to Swoozies! They carry brands like Lilly Pulitzer, Corkcicle, Scout, and more! Check them out at www.swoozies.com. They also have a great selection of goods for your party planning needs including your Atlanta bachelorette party weekend of course. Check out Swoozies on Instagram here. Located in Buckhead is the cute little boutique, The Impeccable Pig. They have reasonably priced clothes that fit any style. They have the cutest collections from Wildfox and Z Supply! You can follow their hashtag #BeImpeccable on Insta to see some of the styles that they have. The Beehive might be one of the COOLEST gift boutiques in ATL! The Beehive carries almost anything from clothing to bath products to housewares and they are all locally handmade. If that isn’t cool enough, they host workshops involving things like sewing, jewelry making, candle making, and more! You can learn more about this awesome place at www.beehiveatl.com. If you are looking to buy locally made products then this is the store you should check out. We personally love when bachelorette groups buy things from local people so make sure you stop in and say hi! You can check out the Beehive Insta here. There are so many places to check out in ATL for the best shopping! While you’re here, be sure to check out Lenox Square Mall, Ponce City Market, and Atlantic Station- they all offer some of Atlanta’s best shops! Happy shopping! 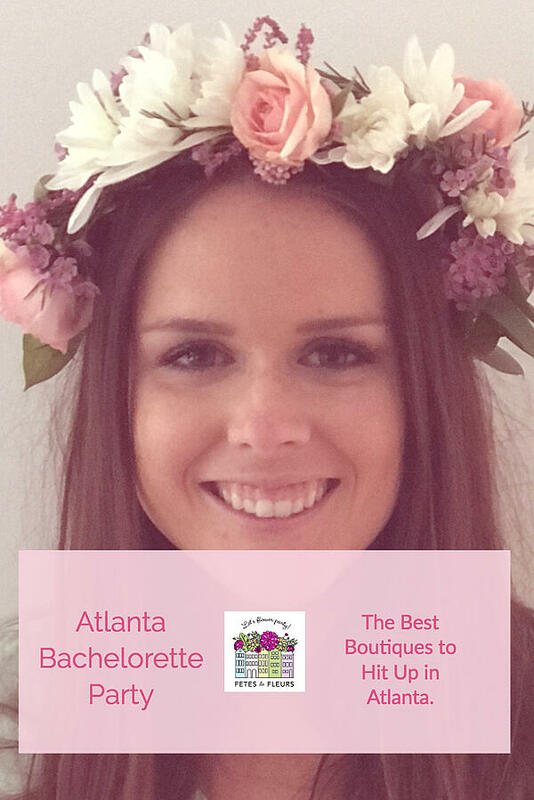 Make sure you request a flower crown party or flower crowns to be made for your Atlanta bachelorette party here. Just think you could shop and bop around wearing your flower crowns! That is a great plan of attack for a fun Saturday in Atlanta on your Atlanta bachelorette party weekend. Margaritas, tacos and bright colors make this bachelorette party theme so fun! There is no better way to celebrate your bride to be than with a good margarita of FIVE (hehe). 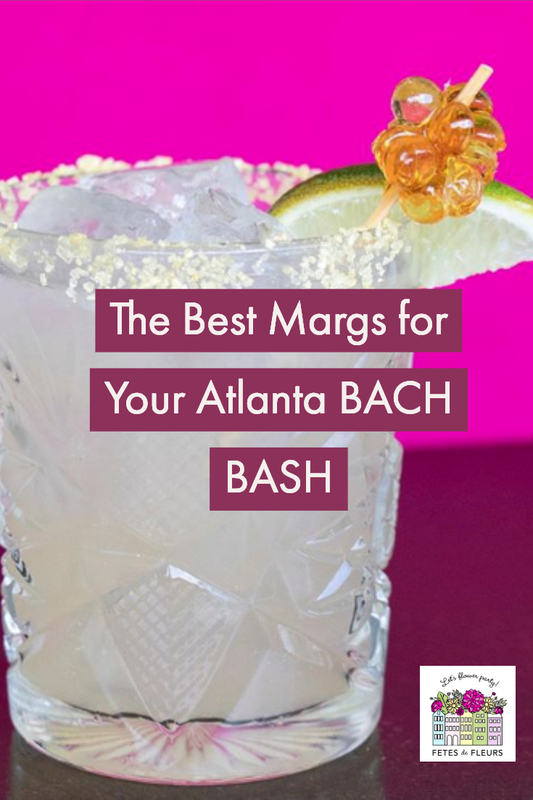 Atlanta has some great restaurants that are known for their margaritas- you should definitely check out my favorite tacos places while you are here: Bartaco, Superica, The El Felix, and Red Pepper Taqueria for a fiesta-themed bach lunch or dinner! 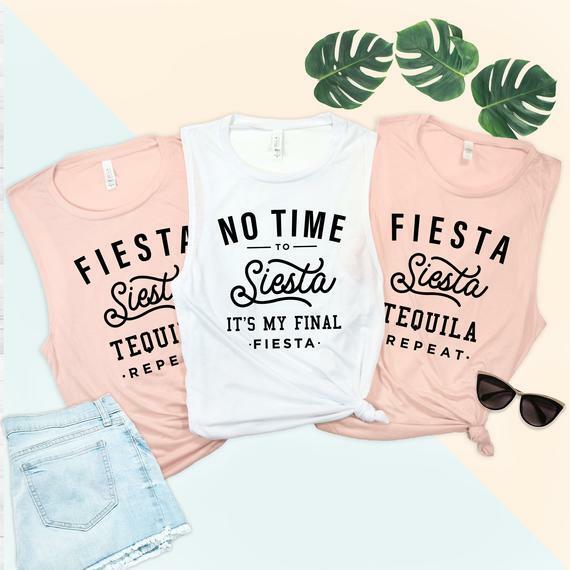 I found these SUPER cute tanks on Etsy that would be great for a final fiesta party bachelorette party theme. These would be so fun to wear if you and your girls are hanging out by the pool at your hotel or just walking around and exploring the city. Etsy is also full of fun little fiesta favors like tattoos, cozies and balloons! Just add flower crowns with these cute shirts and you are ready to rock and roll around Atlanta. No time to siesta, it's my final fiesta! Fiesta, siesta, tequila! (we agree). Not every bride is down for a wild weekend for her bachelorette party weekend. Or maybe you want some wild with some chill. 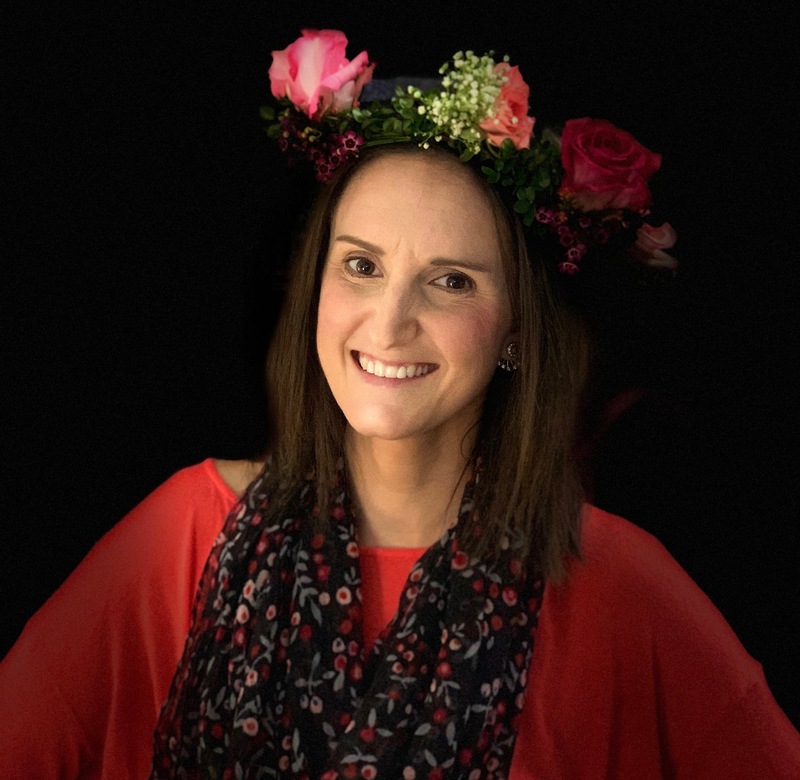 Whatever your vibe is we can help you have a great time with a fun activity making flower crowns. I love this theme for a low-key, relaxing bachelorette party. This is perfect for a weekend of pampering, wine-tasting, and celebrating! Atlanta has some great hotels with even better spas for you and your bride to be to relax before the wedding. Mani/pedis, masks, and massages would be so fun with your girls! Then head out to some of Atlanta’s best restaurants or wine bars to continue the fun! Check out my other blog post about some of the best wine spots in ATL to try! Custom wine glasses would be a super cute party favor to go along with this bachelorette party theme! This is such a classy and fun them to use when celebrating your favorite bride to be! 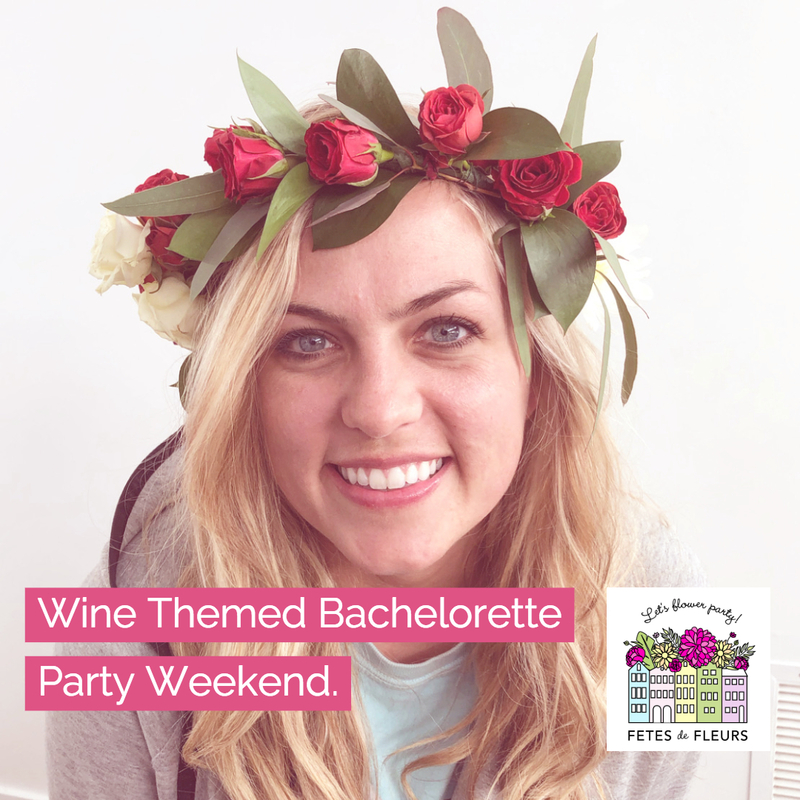 Just add flower crowns in pink or red shades and we can match your wine themed bachelorette party weekend. This one might be the most ATLANTA bachelorette theme ever! If your bride is a true Georgia PEACH, then you have to go with this theme! You can do all things Atlanta with this theme, from eating the best burgers at The Varsity to shopping at Lenox and everything in between. Atlanta has so many fun things to do that will make the bachelorette party one to remember! 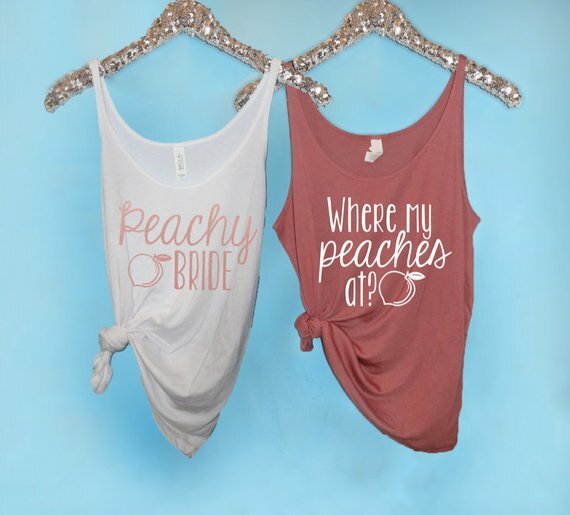 I found some really cute tanks on Etsy that would fit this peachy bride bachelorette party theme. They are perfect for Hotlanta’s summer days by the pool or exploring everything to do in the city. 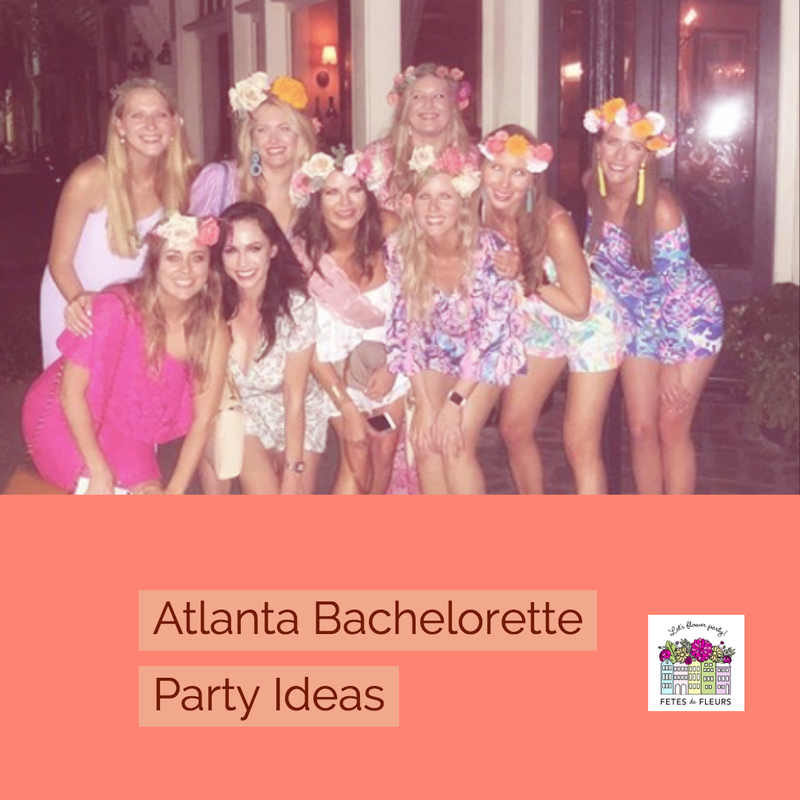 Flower crowns in peachy colors would fit in perfectly with this bachelorette party theme! Peachy colored flowers mixed with some white is so pretty and would looks so cute with those tanks. 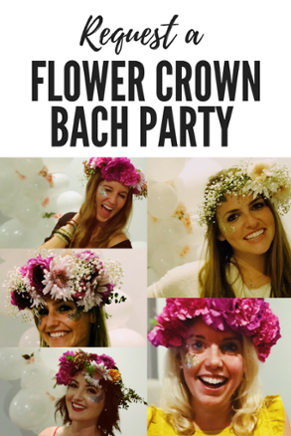 They would definitely add some girly, fun flair to your bach party! Pop the Bubbly, She’s Getting a Hubby! Bachelorette party themes can be customized to where ever you decide to get away to for the weekend celebrations. Atlanta has so many great attractions, restaurants, and scenery that any theme would be fitting. 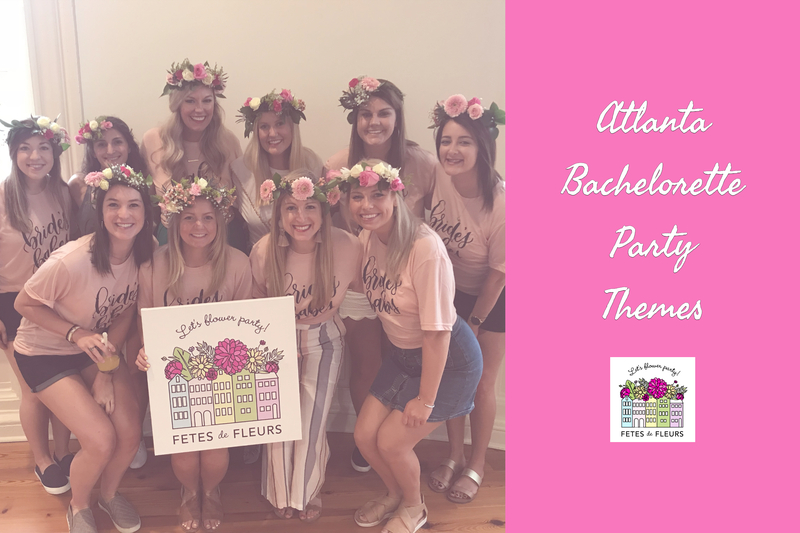 No matter what the theme is flower parties are always a MUST on any bachelorette party weekend. 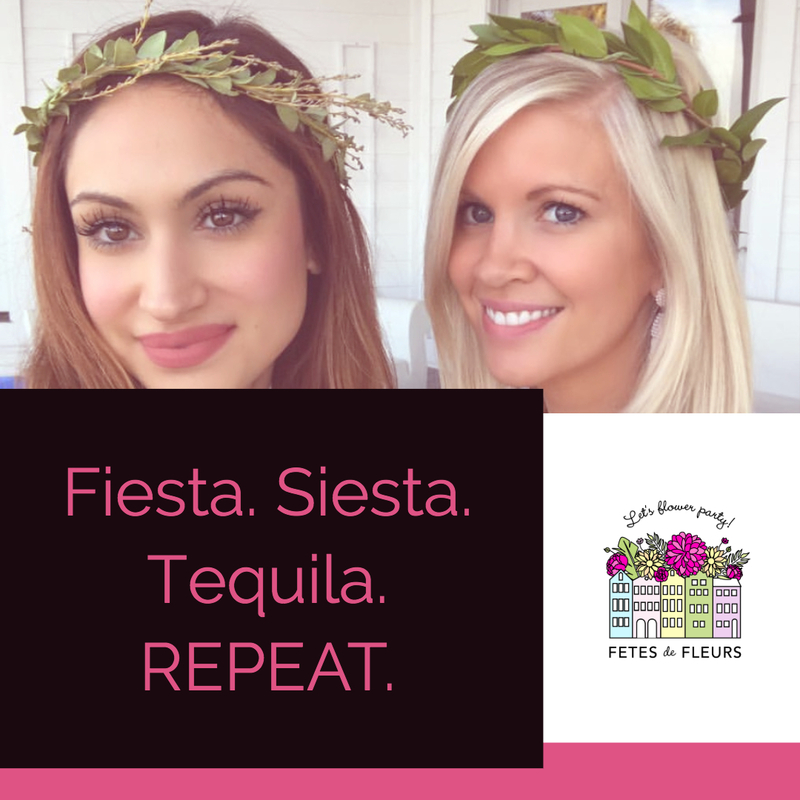 We can bring a party to you and help you create the PERFECT flower crowns for you and your girls to wear around town for your celebrations in Atlanta.